Close by to the charming Bar Harbour village, Bluenose Inn is a beautiful hotel that exudes the classic New England coastal style. With stunning views of Frenchman Bay, you'll be treated to amazing vistas at every turn here. All of the rooms are spacious and comfortable, though we would recommend the Mizzentop rooms or suites for an extra je ne sais quoi. Families will surely love the Two Bedroom Apartment, offering privacy and relaxation as well as luxury amenities. The restaurant here is fabulous, with glorious views of the bay from its outdoor deck - fit with a firepit for lazy evenings with friends or family. The indoor and outdoor pools are lovely should you fancy unwinding - a fitting end to a day full of nautical adventure. The Bluenose Inn is just a short stroll to Bar Harbour village and it's many activities including museums, summer concerts, beaches, fishing harbours and many fairs and festivals which are held throughout the year. You could also make a trip to Acadia National Park. Stenna Nordica - There are 45 rooms in this three level building, all offering lovely views of Frenchman Bay, a choice of one king, two queens or two double beds, and a balcony with deck chairs. Two Bedroom Apartment - Ideal for families, this apartment boasts a living room, a kitchen, and two ensuite bedrooms. There's also a large patio and a path that leads to downtown Bar Harbor. Mizzentop - There are 52 rooms in this fabulous building, all of which are spacious and decorated in a classy style. Most of these rooms come with a fireplace and private balcony overlooking Frenchman Bay, as well as the usual amenities. Mizzentop Suites - These two-bedroom suites feature a private living room with a fireplace and flat screen TV, as well as luxurious amenities including a Bose sound system and microwave. Looking Glass Restaurant - A charming restaurant serving delicious dishes for breakfast and dinner alongside beautiful views, a scenic deck, and even a fire pit. The Quality Inn hotel is within walking distance from the historic village of Bar Harbour and its waterfront. 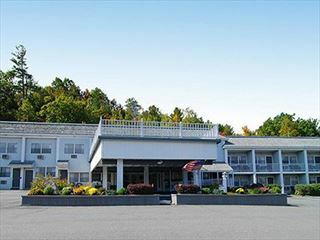 It is ideally located close to Acadia National Park and the Abbe Museum. This charming hotel is situated on the south coast of Maine. Perfectly located by Dock Square, in the heart of this seaside village, it is just steps away from historic sights, galleries, and speciality shops.